Stop killing yourself with cigarettes. Take the step towards changing your life now with the decision to stop smoking. "The American Cancer Society Great American Smokeout grew out of a 1971 event in Randolph, Mass., in which Arthur P. Mullaney asked people to give up cigarettes for a day and donate the money they would have spent on cigarettes to a high school scholarship fund. In 1974, Lynn R. Smith, editor of the Monticello Times in Minnesota, spearheaded the state’s first D-Day, or Don’t Smoke Day. The idea caught on, and on Nov. 18, 1976, the California Division of the American Cancer Society succeeded in getting nearly one million smokers to quit for the day. That California event marked the first Great American Smokeout, which went nationwide the next year." Sorry, I did not find out about this campaign before 15 November but still, it is never too late to stop smoking. Choose another day to start your "new beginning". Incidentally, the International World No Smoking Day is every year on 31 May. Choose a day to put down your cigarettes for good. I encourage you to use your day as a new beginning, a fresh start to a life without cigarettes. A life where you can breathe easier and give your family and friends a chance to breathe easier as well. Respect you body that day and pass on the cigarettes. I know it won’t be easy but I’m certain you’ve faced harder challenges in life before. The American Cancer Society sponsors programs designed to help you quit and there are lots of other programs as well. "This past August, I celebrated my 4th anniversary since I smoked my last cigarette. I used hypnosis to help me quit smoking. That’s really the whole reason behind this website! I had tried to quit before, but using hypnosis was different. I never dreamed I could go from a smoker to a non-smoker that quick & that easy. Sure I had a great desire to quit and high expectations for hypnosis, but in the back of my mind, I still wondered if it would really work? Well it did work and I’m living proof of it. And if I didn’t think it could help others, I wouldn’t waste my time singing the praises of hypnosis & self hypnosis! If you have that desire to quit, to breathe fresh clean air and get your life back on a healthy track, then I know that hypnosis could be the answer you’ve been looking for." If the idea of using self hypnosis in the comfort of your own home appeals to you, I encourage you to look at the hypnosis MP3 downloads which have been recorded by expert hypnotherapists. For the cost of a few packets of cigarettes, you can be free of the addiction forever. ...if you could quit smoking without any discomfort!! Right?! As a smoker you have been brainwashed that to quit smoking is something very difficult. You think you will suffer from withdrawal pains, extra stress, extra kilo's, you will miss your 'best friend' when you quit smoking. If you are looking for a way to quit smoking without any discomfort, quit smoking without having the feeling to 'give up' something, quit smoking without having the feeling to sacrifice something, quit smoking without having the feeling that you punish yourself, quit smoking and finally feeling FREE and alive,...if that's the way you would like to quit smoking, then The Easy To Quit Smoking Method can help you. 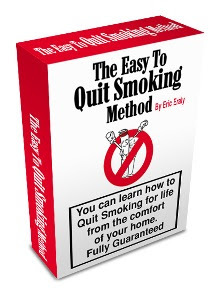 Eric Eraly has helped over 10,000 people to quit smoking, through his books, his CD or his Stop Smoking Seminar. One thing is a fact : The Easy to Quit Smoking Method Works!!! The question is : Are you ready to apply it now?! "But it's sad that people who have been doing self-improvement for over a year, people that have actually decided to look at their self and their life in such a developmental perspective, STILL SMOKE! IF YOU WANT TO IMPROVE YOURSELF AND YOUR LIFE: DEVELOP SOME WILL POWER AND QUIT SMOKING!!" When I was a Herbalife distributor, I remember Mark Hughes (the President) recommending that distributors lose their excess weight if they want to talk to others about losing weight and STOP SMOKING. Herbalife is a health company, not just a weight control company. We sold products for cellular nutrition to feed the body so it was totally contradictory to our purpose to smoke. Thing is that many smokers do not realise that they stink. If a smoker sits next to me, I have to move. It is no use just rinsing their mouth with water or chewing gum - their clothes and hair stink. Is continuing to smoke relevant to personal development? Of course it is. PD is about learning and growing to be the best you can and conquering your demons and weaknesses. Choosing to poison yourself and pollute other people's air is most definitely a weakness. If you are a smoker reading this, please listen to the message. "I never smoked tobacco but I used to smoke grass. I eventually realized that any kind of inhalation of smoke markedly decreases breathing capacity. I chose breathing. I'd rather live as long as possible with as much vitality as possible, and its clear to me that is not feasible with habits that inhibit lung function. Deeper breathing - more oxygen to the brain, too." "They say begin with the end in sight. Many people preach about the importance of starting your business with the end result in sight. If we take such care in our business we should be equally diligent in our personal lives. If you begin smoking with the end in sight how can you smoke? Smoking is an investment with constantly diminishing returns." Dizziness may occur during the first one or two days. Take a quick break, it will pass. Headaches may appear at any time during the first weeks. Try to relax. Take any usual remedy for headache, a cold cloth on the back of your neck, or relieve the stress by taking a short walk. Tiredness may occur during the first few weeks, but if you meditate or relax during the first few weeks, it will pass. Coughing may actually increase during the first few days, simply because the residue from the smoke has not been flushed from your system. Tightness in the chest may occur in the first few days. Rest and take deep breaths, it will go away. Sleeping problems may occur in the first few days. Try to stay away from drinks that have a high caffeine content and try not to exercise too strenuously in the hours prior to bedtime. A hot bath prior to retiring at night may also be helpful. Constipation may occur in the first month after you quit. If this occurs, eat foods with a high fiber content, drink plenty of fluids, and do some light exercise. Concentration may tend to wander during the first few weeks. Be ready for this, take a break or do something physical for a short period of time. But...it will all be worth it! I have just received info on the LiveFree method of quitting smoking. How does it compare with nicotine patches, gums, or inhalers? LiveFree is less expensive and far superior. To break a physical addiction, the substance must be removed, not replaced. The nicotine patch, gum, inhaler, and other nicotine replacement therapy aides add nicotine to the body in small increments. Because of this, many smokers do not completely quit. LiveFree flushes nicotine from the blood and tissue cells, enabling the smoker to quickly escape the physical addiction. Watch this then decide whether you want to keep smoking.